Reza Laal Riahi, a renowned Iranian painter and sculptor, has passed away in the Belgian capital of Brussels at the age of 98. Laal Riahi was born in Iran’s Mashhad on September 26, 1918, but had been living since 1963 in Brussels, where he created oil paintings. A former colonel in the Iranian Army, Riahi studied at the Academy of Fine Arts in Tehran and taught there from 1953 to 1960. Riahi was also an accomplished sculptor. 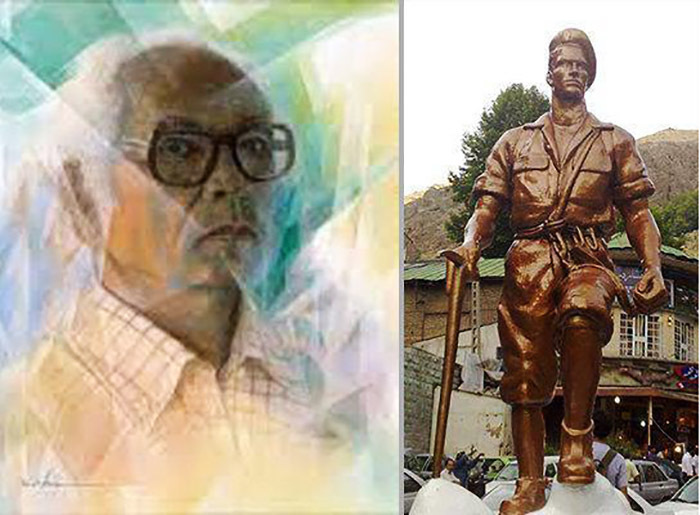 His sculpture, ‘Mountaineer Statue’, is still on display in Darband, north of Tehran. In 1947, he enrolled at a military school in Belgium where he met a Belgian lady who later became his wife. He two daughters and a son who are all living and working in Belgium. In 1961 he published a book on his paintings — The painting Collection of Reza Laal Riahi. Back in 2004, six of his paintings were put on display in an art exhibition in the Wezembeek-Oppem suburb of Brussels. “I paint everything and all subjects, portraits, scenery animals. […] I feel deeply honoured,” Riahi told IRNA at the time. Mojtaba Mousavi, an official with Tehran’s Municipality, announced his death at the age of 98, and expressed grief at the loss, vowing to protect the only heritage left of him in Tehran, namely the Mountaineer Statue, which was installed there in 1962.